Construction of the Fremont Bridge took several years, starting in the late 1960s, and it was opened in November, 1973. Perhaps the most dramatic part of construction, however, took place on March 16, 1973 when the central span, built in California and barged to Portland, was lifted into place. The biggest bridge lift in U.S. History ended at 5:30 pm Friday as 32 hydraulic jacks took their final bite on the 6,000-ton Fremont Bridge center span and hoisted it the final 2 1/4 inches into position. Ironworkers immediately began fastening side plates to the 902-foot center span and the bridge approach ironwork so the arch would not sway over the weekend. Engineers and ironworkers were told as soon as the plates were fastened that they could knock off for the weekend. 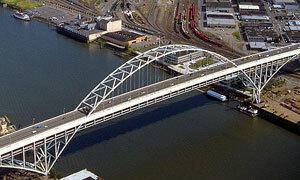 The Fremont Bridge is the second longest tied arch bridge in the world, only the Caiyuanba Bridge in China is longer. Until Tilikum Crossing opened in September 2015, the Fremont was the newest bridge spanning the Willamette River in Portland. I think you’re off by a year. The lift took place March 16, 1973, not 1972. Thanks Brian! I updated the post. I had even cited the Oregonian story, which of course appeared in the 1973 paper, but my mistake persisted. Doh! Do you know of any footage that exists of the lift? Yes my uncle and his brother straightened this bridge as the bridge didn’t quite meet the approaches. My uncle Dave Holt and his brother Dan Holt Stayed at my parents house off and on while working on the huge span.